I’ve thought a lot about being a mom lately. I mean, I already AM one, but I’ve been pondering what it really means to be a mom. Technically, I guess anyone who has delivered a baby is a mom…or would she be a mother? Either way, my thoughts have been about being a GOOD mom. My two-year-old started preschool last week. Up to this point, he’s only ever stayed with family during the day, so it was a big milestone…for him and us! He did well the first day (last Thursday) just crying a little when some of the other kids cried, then the next day he cried a little bit more when we got there then he was fine. He only goes Thursday and Friday mornings for 3 hours, so when he went back yesterday, there were tears again. Yesterday, he started crying as soon as we got into the parking lot, but he wanted to go in. He cried a little, but wasn’t clinging to me or begging me not to leave, so I told him his Poppy would be there to get him a while and he was fine. Today, he didn’t cry at all and didn’t seem to mind staying, thank goodness. For the first time yesterday, when I saw those heartfelt tears as we pulled into the parking lot, I felt the pain a parent must feel countless times throughout their child’s life. I guess it’s similar to the pain you feel when you take them for their shots, knowing they are experiencing physical pain, but this is different. This pain is knowing your child is hurting emotionally and there’s not much you can do about it. Growing up, I was a homesick kid until about the age of 13. I went to Bible camp and came home early. In the 4th grade, I went to 4-H camp and cried all week, but didn’t get to come home. It’s the most gut-wrenching feeling in the world. So, when I know my son is having similar feelings, it tears me up inside, too. I say all that to say this – being a mom isn’t easy, but I can’t explain how rewarding it is. When I was leaving to go to work the other day, Ezra runs down the hall saying, “Wait momma. I have to give you a kiss.” Now, what else in the world is sweeter than that? I didn’t even have to ask for it! Being a mom is taking your kid to preschool. Being a GOOD mom is wiping away his tears, feeling his pain, and looking forward to the time you are back with your child again (among a million other things). 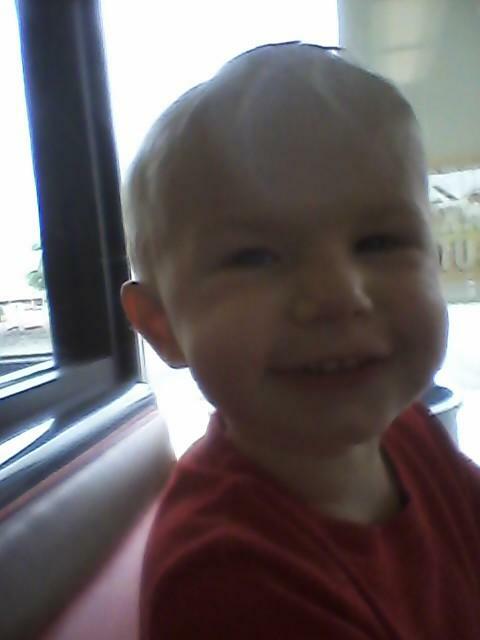 Our happy Ezra after preschool today having lunch with his daddy. I caught a glimpse tonight of what my life would be like if my parents were still married. They divorced when I was about 18 (so about 14 years ago, I guess). At the time, I was bummed, but it didn’t really bother me like it does now. When I had my son, I realized how nice it would be if my parents were still together. Not only would it make the holidays easier, but it would just be nice to have two sets of grandparents…not three or four. I don’t have hard feelings toward either of my parents for the decision they made to separate, but I guess I just feel sorry for myself wishing circumstances were different. I should just be happy they are alive and well and actually get along. Either way, my son and I took my dad out to dinner tonight for his birthday. After dinner, my mom came to pick my son up so he could spend the night with her. She came into the restaurant to get him and on the way out the door, my dad was in front of me carrying my son and my mom was behind me. At that moment I thought, “So, this is what it would be like if they were still together.” It broke my heart to be honest with you. After we parted ways, it was all I could do not to cry while driving home. Dad was still with me and I didn’t want to have to explain my tears. I don’t write about this to get sympathy or make my parents feel bad. I believe that I’ve learned a valuable lesson from my parents about what it takes to make a marriage successful and how important it is to work at a marriage so you can be a family when your kids are grown…and when your grand kids come along. I love my parents dearly and appreciate all they do and have done for me. I feel very blessed. I just pray that my husband and I have a long, happy life together and get to see our grandchildren one day. I got to thinking about how “old fashioned” I can be sometimes. I think that’s one reason I feel so cozy and comfy in this temporary house we’re staying in until our new house is ready. I think it was built in the 40’s and the decor looks like something from the 70’s. But I like it (for now). What makes me old fashioned? For one thing, I’ve never signed up for Twitter and I don’t think I ever will. Secondly, I swore off Facebook over a year ago (one of the best decisions I ever made). Next, I don’t own any type of tablet or smart phone. I have a dinky slider phone so I can make calls, text, and check the weather. I do have the internet at home, but I’m using a fairly old laptop my mother-in-law has let me borrow. I have found that you don’t need a bunch of gadgets to make you happy. Pleasure is found in the simple things and I’m glad I’ve learned to embrace that in my 30’s. I hope I can instill that in my children as well. OH, one other thing. I still believe in a hand-written note – especially a thank you note. Those can be more valuable than gold. What makes YOU old fashioned? I googled “old fashioned” to find an image to use and this one was it! It reminds me of a time when my little sister and I got a hold of my dad’s razors. We cut our faces all to pieces trying to “shave”. Oh, the memories! I’m sitting here in my living room enjoying the calm before the storm. It’s a little after 6 am and I’ve been up for about an hour (thanks to my husband needing a bathroom break). I’m blaming it on my pregnancy hormones. Once I’m awake in the mornings, it’s hard to go back to sleep. When I’m not pregnant, I don’t seem to have that issue. Anyway, I’m glad I woke up early, because I had time to read a little bit of the upcoming Sunday school lesson for the week and say a good long Christmas prayer. I don’t have quiet time with God nearly enough, so it was a blessing waking up early. 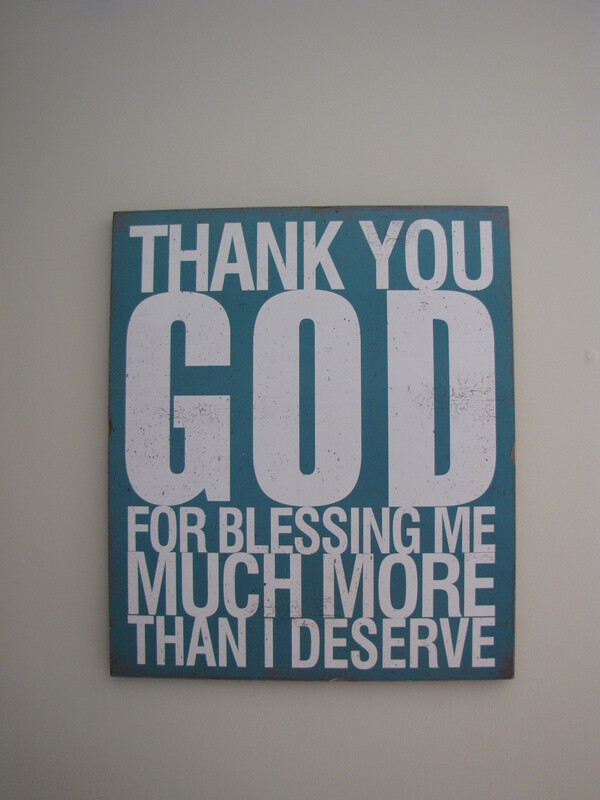 This morning, I gave thanks for all the many blessings God has given me and my family. I’m amazed at all the gifts my son has received for Christmas and what we’re able to provide for him on the money we make. I prayed for my friends and family, that they would be blessed throughout the coming year. I prayed that this unborn, 10 week old baby in my belly would be healthy and all would go well. I asked prayer for those mentioned in church Sunday, for there were many. I requested to be made more whole each day so people will see Jesus through me and know Him better. It won’t be long and my son will be waking up for the day. He’s not quite two and he actually may surprise us by sleeping in a bit later since he went to bed a bit late last night. We had a family dinner at 6 pm yesterday and didn’t get home until his bed time. I’ll just say he was over stimulated by all the gifts, people, and food (I guess there were 40 or more people there) and it was a tearful winding down. He just had so much to play with that he was overwhelmed, poor kid. But, I’m excited about him getting up this morning to Santa’s gift. I’m especially excited about this tent we got him! One thing that’s not in the picture is one of our dogs, Cujo. I totally forgot my husband let him in last night and it took me a few minutes to realize he was out cold on the couch. 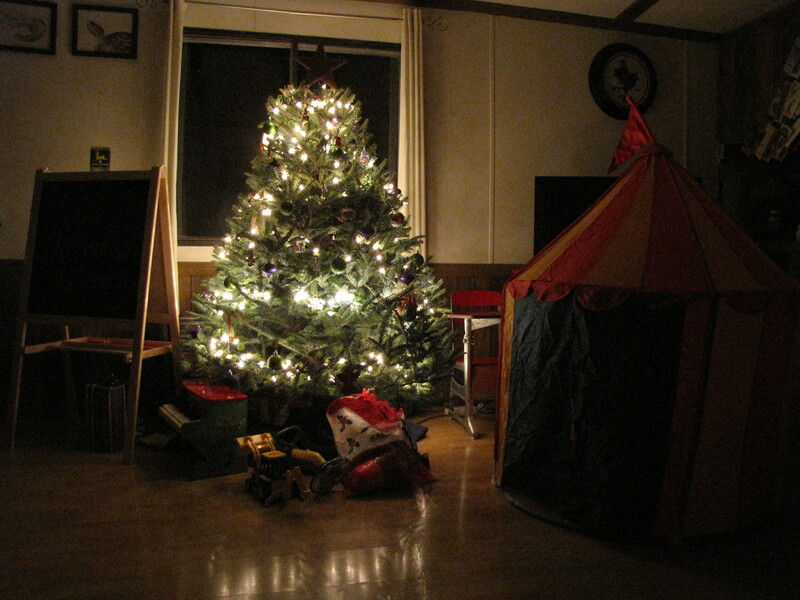 It’s kind of dark, but this is what my living room looks like this morning. I hope you have a very, merry Christmas full of family, love, and peace. Know that the best gift of all was given to us many, many years ago as a tiny baby boy. 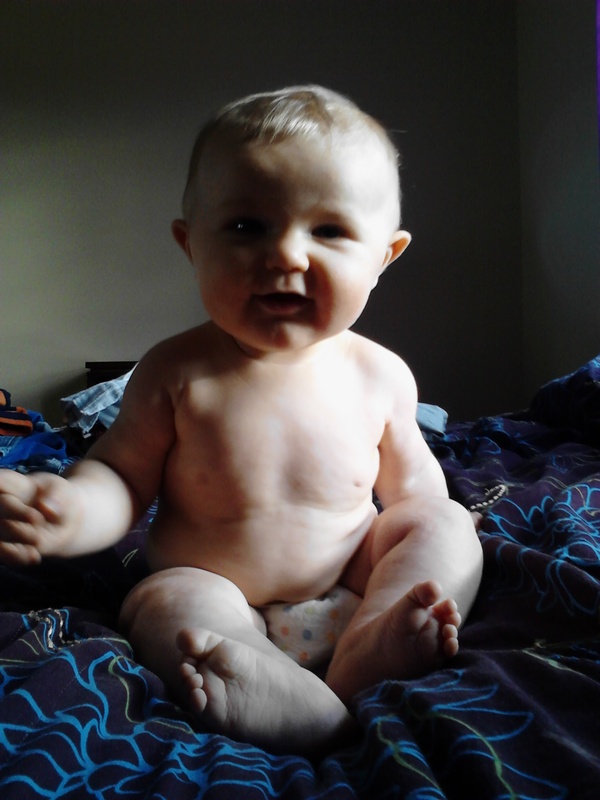 The baby that would give us all the hope of eternity in heaven. Blessings to you and yours.